Domus and Audi's Milan Exhibit Explores "The Future in the Making"
New ways of producing furniture were being explored in the exhibition "The Future in the Making"; an event organized by Domus and Audi for Milan Design Week. Hosted in one of Milan's most opulent and elegant mansions, the show examined the radically changing face of design, and opened up new perspectives with fresh ideas from a crop of designers who've dedicated their work to reshaping the technological, material, philosophical and economic frameworks of design. 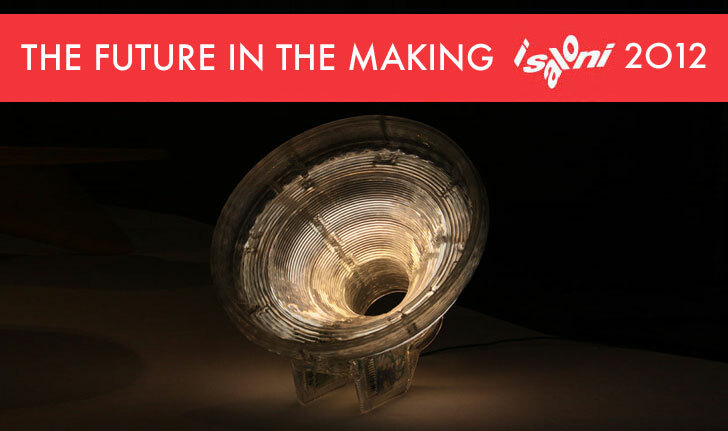 From open-source platforms of collaboration to the phenomenon of crowd-funding, the show highlighted how new production and networking technologies are transforming the way design is done. Hit the jump to see some of the standout work from "The Future in the Making". Award-winning designer Dirk Vander Kooij showcased his reprogrammed robot ‘Endless’, and the furniture line it produced at this year’s fair. The colorful range of “Endless” chairs and tables have been printed by the robot using recycled refrigerator interiors. It takes only three hours to produce a chair and the robot can be reprogrammed at any time to introduce changes to the design. Vander Kooij also debuted his beautiful Aluminium Chair. The chair is made from aluminium bits in a synthetic mix and has a seat polished to a satin finished. The mixture gives a wonderful sparkle to the finish and allows for a sleeker, more sturdy design. Another new design by Vander Kooij is this floor lamp made with ground-up recycled CD casings. 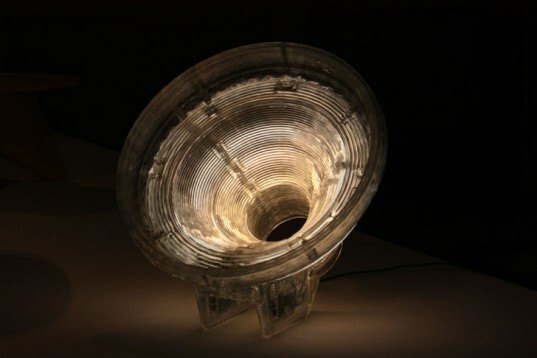 The light source is embedded in the transparent material, giving the whole lamp a glow of different intensities. The Endless robot was printing furniture non-stop at the exhibition, showcasing the many possibilities it offers — from designing new pieces on-site to creating variations of existing designs. The robot uses an extruder that turns recycled e-waste into a stream of plastic material, which the robot uses to print each layer of a product — much like a 3D printer. When all the layers are done, the product is ready for polishing. The crowd-sourcing platform Kickstarter.com is revolutionizing the traditional production process by helping entrepreneurs fund and self-produce their designs. Kickstarter has been growing rapidly for the last 3 years, and is estimated to raise more than $150 millions for its user projects this year. Here, the exhibition displays some of the industrial designs produced via pledged funds — all of which have exceeded their target amount. Above you’ll see ‘Printrbot’, a desktop 3D printer that can be assembled in just a couple of hours. Designer Brook Drumm has reduced its complexity to a minimum to make it simple enough to be used in every home. Diatom Studio presented Sketch Chair, an open-source software tool that allows anyone to design and build their own chairs. With the help of a 2D drawing interface, users can create their own design and test its stability. Alternatively, they can use and edit designs that have been uploaded to a common database. 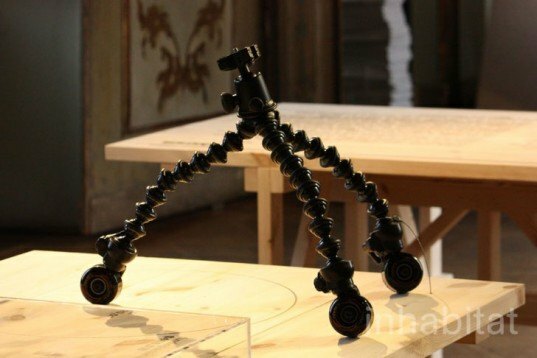 CineSkates Camera Sliders is a set of three wheels that attach to a tripod and enable fluid, rolling video. The product designed by Justin Jensen can produce shots that have previously only been possible with bulky and expensive equipment. The tripod can be used for weddings, sporting events, product demos, and anything that could benefit from a different shot. Backed by 2000 people, the project has exceeded its funding goal by 24 times! Award-winning designer Dirk Vander Kooij showcased his reprogrammed robot 'Endless', and the furniture line it produced at this year's fair. 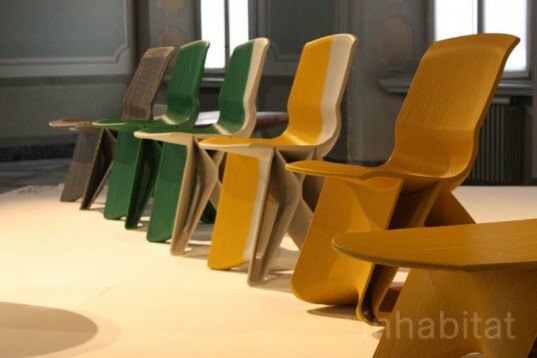 The colorful range of "Endless" chairs and tables have been printed by the robot using recycled refrigerator interiors. 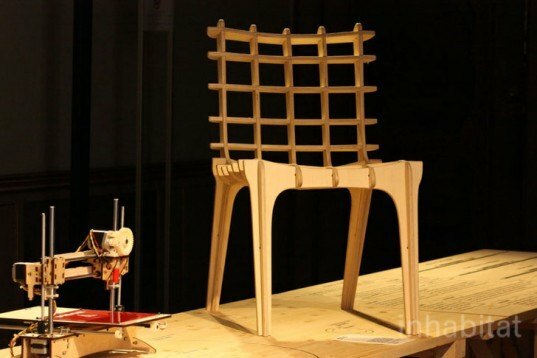 It takes only three hours to produce a chair and the robot can be reprogrammed at any time to introduce changes to the design. Dirk Vander Kooij also debuted his beautiful AluChair. 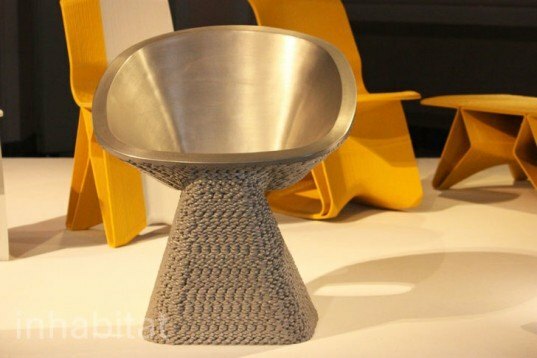 The chair is made from aluminum bits in a synthetic mix and has a seat polished to a satin finished. The mixture gives a wonderful sparkle to the finish and allows for a sleeker, more sturdy design. 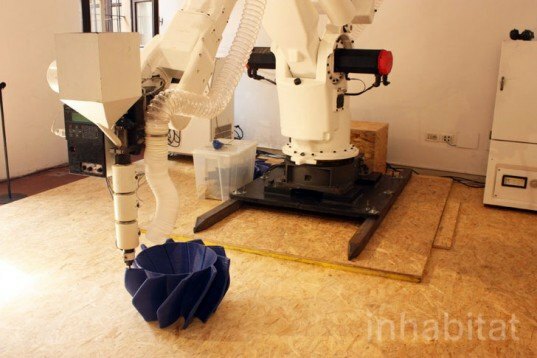 The Endless robot was printing furniture non-stop at the exhibition, showcasing the many possibilities it offers -- from designing new pieces on-site to creating variations of existing designs. The robot uses an extruder that turns recycled e-waste into a stream of plastic material, which the robot uses to print each layer of a product -- much like a 3D printer. When all the layers are done, the product is ready for polishing. The crowd-sourcing platform Kickstarter.com is revolutionizing the traditional production process by helping entrepreneurs fund and self-produce their designs. Kickstarter has been growing rapidly for the last 3 years, and is estimated to raise more than $150 millions for its user projects this year. Here, the exhibition displays some of the industrial designs produced via pledged funds -- all of which have exceeded their target amount. 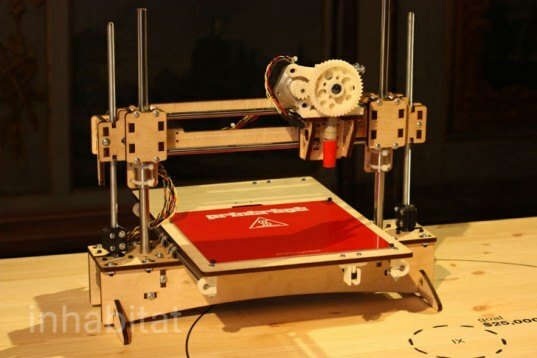 Above you'll see 'Printrbot', a desktop 3D printer that can be assembled in just a couple of hours. Designer Brook Drumm has reduced its complexity to a minimum to make it simple enough to be used in every home.